During compressed wood pallet production line process, rotary drum dryer machine is necessary equipment for wood shavings drying which are transferred by the pipe. The working temperature of rotary drum drying machine can reach up to 150℃-180℃ and the water content of wood shavings is below 10% after drying. 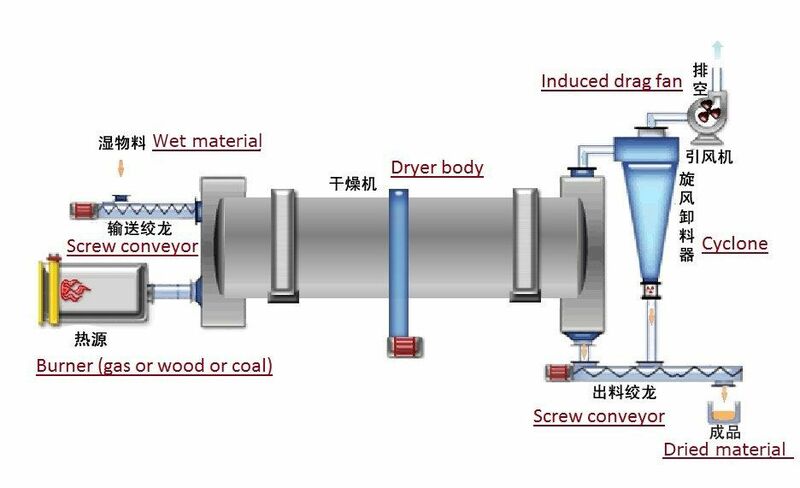 How does rotary drum dryer machine work? First, material after transfer system enters into the rotary drum dryer cylinder, flied by raising plate device which are uniform distribution in the drum cylinder. The material are evenly distributed in rotary drum dryer cylinder which can bear high temperature, then fully contact with the hot air, speeding up the drying heat and mass transfer. During the drying process, under the effect of plate and hot treatment in the rotary drum dryer, the materials are dried as the requirement. At last, the dried material come out from the end of the rotary drum dryer. Rotary drum dryer machine has CE certification. The components of rotary drum dryer machine meet nation standard. It can prove that rotary drum dryer machine has high quality. The internal of rotary drum dryer machine adopts assembled structure which improves the accuracy, and it is easy to transport and install. Rotary drum dryer machine adopts assembled lifting board so as to exchange heat fully and lower the energy consumption. Rotary drum dryer machine is equipped with temperature induction monitor, uniform vibration and airproof setting, to improve performance and productivity efficiently. Rotary drum dryer machine uses new type feeding structure so as to dry the material quickly. Simple design, self-insulation, and improving the heat efficiency to exceed 80%. Delicate structure, and stable operation. Good drying performance, coal consumption < 8kg when drying 1 ton material. The fuel can be coal, oil, natural gas etc, dry mass, granule and powder material. Reduce land area for 50%, so construction investment is saved 50%. Lower outlet temperature so to longer the service life of dust removal. Drive by supporting roller not gear. Finished product moisture can be adjusted according to the different requirements. Finished product temperature lower than 60°C, and working continuously.